I was totally seduced by the thought of taking the night train from Mombasa to Nairobi. A journey that many have written about and survived. This train is from a bygone era when the white man ruled supreme in Kenya and was the only link between the coast and Nairobi city. Needless to say the train is full of Britishness and is unique in every way. 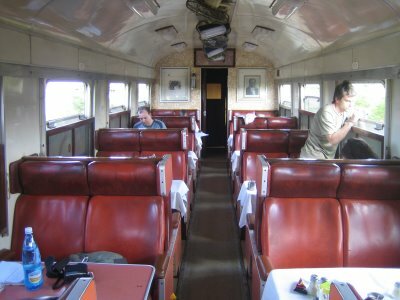 The dining car is resplendent in 60's decor, red leather seats, old pictures of white hunters with their kills, pristine white tablecloths, silver cutlery and somewhat chipped china plates. The mustard pot was shining amidst the myriad of condiments on the table. Peris my fiance was totally amazed for so many reasons. First time on a plane down to Mombasa, first time seeing the oceans waves, first time finding sea shells, first time on a train. The joy of giving her such experiences was incredible, things that we take for granted each day. How could anyone question the decadence of another generation when it comes to breakfast in the middle of the African heartland. So how did this journey start? It was quite simple, a booking, a ticket, turn up at the appointed time. Much like a journey anywhere else in the world. You would have thought that this would be simple but of course you have to realise that you are in Africa and nothing is simple, in fact you have to make sure you have some extra money in your back pocket to make things move. That is the norm, its expected by both parties, its acceptable and understood. Mombasa is a cosmopolitan city, full of history that goes back to invaders from Portugal, Arabia, Britain.....back to Portugal and so on. However my fears were allayed when the menu arrived and it did not contain pictures of available women. Just many different varieties of coffee, I was lost but eventually went for the local blend which was full of ginger and the warm glow made me think of eastern promise....I am convinced it was full of something else. However the rain went off and we managed to splash through the flooded streets. As time rolled on it was the moment to visit Fort Jesus which used to be the protection for the area when it came to invaders. A very stout castle as we would call it here in Scotland with many rooms and escape routes for those that could not bear the cannonballs. I had a smile on my face as the guide showed me the rows and rows of black painted cannons which had the seal of a Scottish company... near Glasgow. So many hundreds of years ago and Scotland keeps coming up with all its influence in the world. I smiled a lot! So I digress, one of the most enchanting moments was to turn up at the main railway station for our journey back to Nairobi. Make sure our tickets were good, booking was confirmed and it was ok to get the pink slip to show the train manager - more of him later. Once again it was stand in line and wait...this can normally take an hour or so, patience is good. Oh yes, there are heartaches and tears when the person in front does not have the correct papers, but in this environment its everyone for themselves. You cannot be diverted by other peoples problems. It can be disturbing but you have to remain focused. The train was awesome, climb up the steps into another world, far removed from Mombasa old town. Three classes of tickets... 1st class gets you a sleeper, dinner, breakfast, 2nd gets you a sleeper but you share, 3rd gets you a hard seat and you take your chances... but make sure you have water. Knowing the African way I knew that the departure would be delayed and so it happened. We walked the platform and it was my thought to show Peris the engine up front. However, it wasn't there, and her words to me ring in my ears, 'There is no head to this train, how can it move?' A simple question which portrays a Kenyan woman's life. Due to leave at 7pm the train finally left at 10pm and in the interim, dinner was served. Soup or Sorbet?? Fish or Chicken?? Mmmmm, rice or Potatoes??? Vegetables??? Wine or Beer??? It was so bizarre sitting at Mombasa station eating an elegant meal and the train still parked. During the meal a Dutch papa shouted to all, "My camera has been stolen, check your cabins".....we all wondered if our own valuables were safe. I went back to the cabin and the laptop was still there. Then we decided to go down to the platform for a break and met up with this crazy man with a guitar......he was making his living going up and down singing gospel songs. I have to tell you that his guitar was out of tune and I just wanted to grab it and retune it...however he had the most wonderful voice and when it came to Jim Reeves old favorites he was very very good. 'This world is not my home, I'm just passing thru, the angels beckon me, Oh Lord what can I do' will remain on my heart forever. So this Kenyan man, un-tuned guitar, Peris and myself ended up dancing and singing with him... It was a magical moment. The other passengers clapped and laughed at our fun. Travelled from Nairobi to Mombasa twice in 1959 and 1960. Loved seeing part of Africa we would not have see otherwise. Big game at night under a full moon, brilliant! Different to-day I guess if train is not updated- a pity as it was so fantastic, holiday on silver sands at Mombasa, Indian Ocean pulsing to and fro across coral reefs, dhows with sails billowing far off the coast-idyllic. Has it all gone with the advance of time? We loved Kenya and its people. I rode the Mombasa night train in 1987 with a Dixieland Jazz Band called the Askari Stompers. To entertain the passengers we played jazz for several hours and drank a lot of White Cap. I rember the drummer had to set up in the loo due to lack of space. In the morning we woke up to a strange stillness and realised that the train wasn't moving and the passengers who hadn't stayed up late had all left for Mombasa in every available local taxi. I think the village we broke down in was called Mariakani. Anyway we were saved by a lorry from our hotel who arrived at 10am in the morning with more beer. We went on and played our gig on the beach. So what if the sheets are a bit frayed... Live a little. Unfortunately we took this train from Nairobi to Mombasa this weekend and our experience was definitely not a pleasant one - interesting for sure but not an experience we would ever want to repeat. just log on to Nairobi station departures. If you do take the Train,you'll definitely enjoy it. Happy holiday. Train from Nairobi to Mombasa still running? I am planning a visit to East Africa in November and trying to do some research for travel within Kenya. I was told by a friend of an overnight train service that runs between Nairobi to Mombasa 3/4 times a week but he said to me that he was not sure whether the service was still running. I did a google search and came across the website and thought that I might ask for some help. Can someone shed some light on this please as im planning to travel between the two cities and would absolutely love to travel by train rather than air or bus. I looked this site up because my son and his wife have just gone to Kenya for a holiday. I recommended that they do this trip. I did this trip in 1966!. It was fantastic then. The comments I see now are the same as I would have made then. "Sheets torn but immaculately clean" certainly rings a bell. English shillings and EA shillings were 1 for 1 then. I was one of the crew of HMS Zulu based in Monmbers at that time. My Pal and I were on our way to spend an R and R station leave at a coffee plantation. It was great and our hosts were terrific. I don't think they will ever give a sailor a few drinks and ask him to keep a cricket score with a fountain pen again though. Foe all those who have commented, thanks for the interesting reading. ou have made me mored etermined than ever to take the Mrs on that trip before I retire. (and renew my love/hate relationship with Tusker beer). Somewhat belatedly I am responding to all the positive responses re the train trip from Mombasa to Nairobi last year. Chas - The bunks in the sleeping compartment were very narrow! Dave and Iron Snake - I am happy that the report of my trip evoked fond memories. I have to say that I did a lot of preparation prior to the journey and started it with an open mind fully prepared for delays, pitfalls and the unexpected. Its so much easier that way and as I write about the actual trip you will see why. Have a look at 'Your Kenya Stories' this website later today or end of week. Honestly it will make you smile - From Guitar Man on the Mombasa station platform to a motorbike ride across the edge of the Tsavo National Park. Memories of an "Interesting trip"
It was 1995,and we arrived at Nairobi Station in need to use it"s "Facilities". Glad we were booked Ist.class,as even the station loos were graded! God knows what 3rd,was like! The bedlinen was clean but torn,and we still have a laugh about it. The journey through the night was exciting,with many stops,and as dawn arrived the scenery was interesting,with the odd sighting of "Game"
Would definitely do it again,much better than the return airplane flight! Yes, indeed a great experience...more than fifteen years ago we traveled 1st class, when the train was already a bit tatty, but with all it's glamour from the old days...I remember we had short stops in several villages in the jungle type surroundings, and gave away lots of useful bits to the locals, which we had purposely taken with us. Still have many found memories of that trip to Nairobi. Now these are the kinds of pleasures that as a Kenyan I ashamedly admit to missing out on. But when I go back home, I will definitely sample this. Feeling nervous to re-route my entire flight from Burundi to London just to do this train trip, i thank you for putting my mind at ease and putting a leap in my heart. I will now re-route and stop over longer in Kenya just for this trip! Good for you for joining in with Mr Guitar man. You know how is an airplane one can (if predisposed to do so - and on the lucky side) join the mile high club? Well, Archie what I was wondering and you would probably know the answer to this question; is there such a thing on a train? Perhaps it would be called the mile long club?...no that would be misleading or at least counted as a as an innuendo. Maybe the Little Red caboose..no..no..your right. How about the iron rail club?...ok...ok..once again I have been perverse..
A nice story, Archie, of one of the famous train tracks in East Africa. I always love taking the train, no matter in what country I am. But the railway from Nairobi to Mombasa is a special one. Thanks!